Missing teeth can be replaced very successfully with partial or full dentures if dental bridges or implants are not suitable treatments. At Park Place Dental practice in Cardiff, Full or Complete dentures are used to replace all the teeth or just teeth on the upper or lower jaw. Partial dentures fill in the areas created by missing teeth and also prevent the existing teeth from moving out of place. An “immediate” denture is made as a first denture after all the teeth are removed so a patient does not ever have to be without teeth. Many changes go on during this healing phase and several visits to adjust and possibly reline the denture as the gums and bone heal. 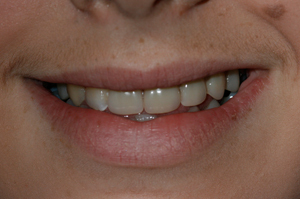 Below is an example of an immediate denture made for a young lady who lost several teeth after a car accident. It quickly replaced the teeth whilst healing occurred and other options such as implants were planned. A “Conventional” denture is usually not made for at least 3 months after teeth have been removed to replace an “immediate denture” or update and old poorly fitting denture. Very detailed impressions would be made of the jaws and several visits with the dentist to try the teeth, set in wax. This allows feedback from you on the colour, shape and position and customising your teeth prior to them being processed in a very strong resin. A Partial denture can be made in an all acrylic base or a cast chrome framework with teeth attached. 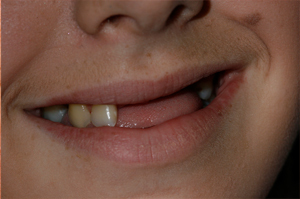 A partial, generally, has a series of clasps or “hooks” that helps to prevent the teeth from dropping out. 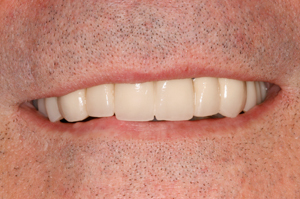 One can also consider the possibility of showing no clasps with a talk with the dentist about a Precision attachment partial denture which has internal “clasps” that attach to crowns that are designed to fit this type of prosthesis. It is a more “natural looking” appliance. 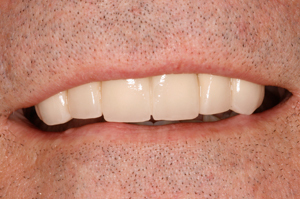 Below is a gentleman who as part of a cosmetic makeover placed crowns and bridges on his front teeth. 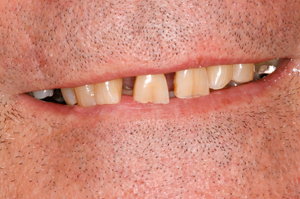 Then he replaced the back teeth with a discreet chrome denture to finish his full smile. Many options are available today in dentistry. We attempt to provide you with all the options when planning this very important step to improving your dental health. For examples of our past cases please visit our smile gallery. We will be delighted to advise you as to the most suitable type of dentures for your individual needs.